1 Do you like dogs? If yes, go to question 2, if not go away. This post is not for you. 2 Do you have a dog? If yes, go to question 3. If not you can hang around on probation. 3 Is/are your dog/s rescued? If yes, you may be interested in this post. If not, hmmmm. Here then, is the promised controversial post about rescues v bought pedigree animals. In which I aim to dispel a few myths and no doubt create a few more. Most of my experience is with dogs, so I’ll stick to talking about dogs, although the post applies equally to cats in particular, other animals, and birds. The principles are the same. As we’ve just homed another rescue dog, it’s a timely post, in which I can reflect about why we did, and what it entails. And equally interesting are people’s comments about our new pup. Since our last dog died we’ve had just one dog – Pippa – for some six years. We haven’t been a one-dog family since 1989/90. After that we always had two, or often three. For non-dog, or one-dog people, two is no more work than one. The only problem with more than two, is the number of hands required to walk more dogs. Probably not so difficult with smaller dogs but when you have a Labrador, a cross setter/Lab, a GSD, a cross GSD/husky it isn’t wise to walk more than two powerful and energetic dogs at once. A few posts ago, Clare asked if there were any Spanish rescue shelters. There are. But they aren’t like British ones. And when I looked it up on the internet it all seemed very complicated. Some of the shelters are virtual, so you look at a photo, arrange a visit and see one dog. I find that mentally difficult. If I went to see a dog and didn’t want it, I would feel as though I was rejecting it. Which would be true. Much easier to wander round a rescue kennel and say, yes, we’ll have that one. And I am so not into home visits. We’ve signed agreements to have those before, but no-one ever turned up. What are they meant to do? Check you have a secure garden? A clean house? Sufficiently affluent? A television? A sink in the kitchen? (We don’t have the last two – and the state of cleanliness varies). It’s like prying social workers. And you could pass the test and still chuck your dog out on the street if you couldn’t be bothered to walk him or her. This was common practice in Spain when we first came, although increasingly more Spaniards in our pueblo are walking their dogs on leads. Originally we were the only ones in the village to do that. Dog social worker leaves, owner washes blanket/rug, retrieves hidden chain and chains up dog outside. Home visits are fraught with difficulty. Checking potential owners must be a nightmare for shelters too. I just don’t really want to get involved with that. With four rescue dogs to my name, living long and healthy lives, I don’t feel like being checked over either. So we decided to by-pass the rescue shelters. There are normally enough stray dogs wandering around to be picked up anyway. Until we want one of course. First step, ask neighbours if they knew of any unwanted dogs. You don’t get anywhere in Spain if you don’t open your mouth. A friend of one of the son’s had some dogs up the back and was happy to get rid of one. That came to nothing. A woman walked past with a pup and had another to give away. Heard no more from her either. So when we went to our vet Pedro for Pippa’s arthritis tablets (Cox 2 inhibitors, Cimicoxib) we looked at his noticeboard. Plenty for sale but also some for free. I sent a text to a woman but got no reply. Next time I went to see Pedro, I left my email and ‘phone number for him to pass on to anyone wanting to home a dog. 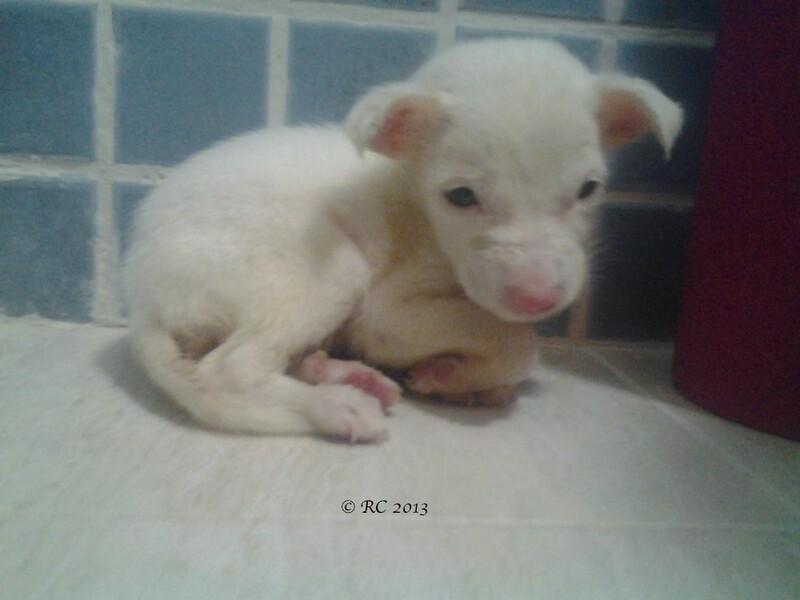 Not long after, I received an email from Rocío about the abandoned pup she had found. ‘He needs a family to love him. If only you can give him an opportunity,’ she wrote. We said we would take him but it couldn’t be straightaway. If someone else wanted him before we could take him, then we said that would be ok. Dog needing a permanent home was the priority, not our wants, it didn’t have to be us, there would always be another one, and indeed there was. Pedro emailed me with details of a Shar Pei cross. Looked more like a scruffy terrier to me, but and a big BUT, how much do looks and breed matter? I explained that we’d given a commitment to Rocío but said if that didn’t work out, we would take the cross. A month later we received another mail from Rocío, we were in Spain that weekend and she brought the 4/5 week old puppy to see us. And as regular readers know, the rest is history, and so is my exile in Spain looking after said puppy. Pippa’s passport has never been asked for on either side. Can’t say I’m fond of jabs but it is a necessary evil. Both Gib and Spain were rabies free countries. I say were, because this year, a case of rabies happened in Spain in Toledo. A pit bull came back into Spain from Morocco and bit five people, none of whom had died, last thing I read. While mainland Spain was rabies free since 1975/78, the Spanish enclaves of Ceuta and Melilla in North Africa have occasional cases, due to being next to Morocco. France has also had isolated incidences of rabies – again due to dogs coming back from Morocco and illegally imported. Source for this – El Pais. We know someone who bought a pedigree puppy for a small fortune, a black Lab. It arrived in Gib from Portugal, was smuggled in by the seller, and had no jabs, no chip, no papers, and on top of that it was ill.
Another neighbour bought a Yorkie – easy to take on ‘planes apparently. Paid £500 and had to pay as much again to the local vet as soon as she’d got it because that was ill too. I mention these two cases to point out that pedigree pups are not necessarily more healthy than street dogs. Nor do they always come with the correct papers. 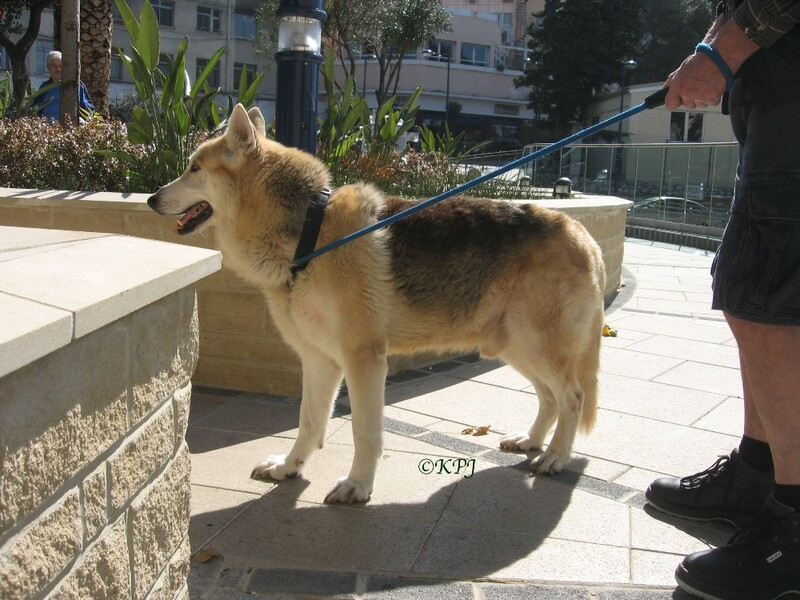 The other week Partner was discussing the issue of bringing dogs/pups into Gib without papers. A few Gibbos told him about dogs that had been put down when Customs had found them. Hearsay? Don’t know, but not a risk I was prepared to take. Let’s get into the nitty gritty, and start with the hierarchy. In my case the bottom of the heap gets priority. Abandoned, dumped, unwanted dogs. Strays. Street dogs. Call them what you will but when I was a kid it was popular to throw them out of car windows while speeding on motorways. I mentioned this to someone and he’d only recently heard of it. Given that he’s only three years younger than me he must have led a sheltered life in a cave. People normally drive away from home to get rid of an unwanted animal (assuming they don’t knock it on the head or drown it) so that a young dog/pup can’t find its way back. If it’s very young it doesn’t matter, as here in Spain it will just die in the full heat of the sun anyway. Or in a rubbish bin. Or wherever. Rubbish bins are popular places to dump dogs in Spain. We know a British couple whose daughter found puppies in a plastic bag by the bin. She took them home and they kept them, along with their other dogs. Next in the hierarchy are dogs in rescue shelters. Some keep dogs for life, hence they are often full if no-one wants to home the dogs. Some kill them after a certain amount of time, for example Battersea Dogs Home, Britains most famous shelter, kills thousands of dogs a year, nearly three thousand in 2009. Recent figures for 2012 say the charity (it’s a not-for-profit and receives no government funding) cared for 5221 dogs and 2760 cats in 2012. The euthanasia rate is 28%, so more than 1 in 4 animals gets killed. The really sensible Dangerous Dogs Act (irony, in case anyone hasn’t got my sense of sarcasm) means that dog legislation officers visit rescue kennels to decide which dogs are illegal and should be killed. Battersea is campaigning against the legislation as they say that more than 90% of the ‘dangerous’ dogs that are killed pose no threat to anyone, and breed-specific legislation for dangerous dogs is flawed. A dog’s behavior is related to its owner’s behavior and how he or she trains the dog, and not any certain breed, she added. Our GSD Prince was a cross between a street dog and a rescue. Although we had got him from a shelter he had been found on the street more than once and had been in and out of the shelter. Poor dog. He had dysentry when he was picked up before we homed him, he’d been scavenging out of rubbish bins. Deteriorating up the hierarchy we have pet shops and puppy mills. I walked past a pet shop in our local Spanish town to see a British woman and her pals tapping on the window to get the cute puppy to move in its tiny cage. It has a bad enough life being caged up for 24 hours a day without some moron tantalising it. And no, I didn’t say anything. Not much point with people who are so thoughtless and unfeeling. Someone told me he’d not realised they existed until he saw a TV prog. Um, where have you been? Another cave dweller. I might not have heard about them until this century but if you mix in any dog circles on the internet they soon come up pretty fast. Most of us prefer some breeds to others. I’m no different to anyone else. When I was younger I so wanted an Afghan, a Borzoi, a Saluki, an Irish Setter. I loved the elegant racy appearance. Paddy was the nearest I got. Cross setter/Lab/maybe spaniel. We think. He was so fast he looked like he was flying. He thought he could as he liked to chase birds. Snowy is another hound group dog as Podencos have greyhound ancestry. And when I’m not drooling over hounds and gundogs, I’m lusting after working dogs – just all of them. Well, maybe not Corgis. So in the UK, if you want to rescue a specific breed it’s not exactly difficult. Greyhound, GSD, Ridgeback, Collie, presumably a whole range of others, they are just the ones I’m personally aware of. Greyhounds in particular, as we knew a woman who did a lot of work with rescue greyhounds. A bit like Podencos, they are often dumped once past their point of usefulness, in the case of greyhounds in racing, for Podencos in hunting. But like all rescues, breed-specifics have their stigma too. People are worried that they are dumped at the breed rescue shelter because the dog is flawed, dangerous, barks, chews, isn’t house-trained, doesn’t like other dogs, cats, kids, whatever. And so, our person who wants a nice dog of a certain breed hot foots it off the breeder because pedigree puppies are the bees knees. And they don’t really want second hand goods that might mean a little work. It clearly escapes their notice that all the dogs in the breed specific rescue shelters will have come from … pedigree breeders. At the top of the list in my hierarchy, we have pedigree breeders. Although I consider them to be a small notch up from puppy mills. The only difference being that dogs/puppies are better looked after. In most cases. I have got into numerous arguments about this before so I will forestall some of the obvious comments. 1) Breeders do it for love not money (or love of money). Well if they like breeding puppies so much, why don’t they keep all of them? Not just the odd one or two? Or give them away and ask for the money to go to rescue shelters? I have been told that after vets’ bills and numerous other unidentified costs that not only do they not make a profit by selling the pups, they incur a loss. Somehow I find that hard to believe. At a cost of hundreds of pounds per pedigree pup, or maybe thousands, a litter can produce anything from £500 to a few grand. Total cost for bringing up rubbish bin puppy at four or five weeks old? Cents. A few euros for bix and some goats cheese and yoghurt. No vet bills for either me or Rocío apart from jabs which any new owner would have to pay for anyway. No Royal Canine specially-formulated puppy food. Just the same bix that Pippa eats. We had a feral cat who gave birth to her kitten in our workshop. I don’t think she spent a lot at her vet either. 2) Breeders have really healthy dogs and the puppies have good temperaments. Really? Remember the two ill pedigrees in Gib I mentioned earlier? Healthy pups from breeders will also explain hip dysplasia in GSDs and breathing problems in overweight dogs/bulldog breeds. For example. There are more. Stupid ridiculous breed standards. No doubt, the healthy pups from breeders myth also explains why my rescue dogs have all lived into double figures, with Paddy in his mid teens. Great report here about ‘the price of a pedigree puppy’ and the health issues. As for temperament, see later comparison in Part 2 re bought peds and rescue. 3) You will get a ‘better’ dog from a breeder and one that ‘meets your requirements’. Get out of it. That one isn’t even worth refuting. To be continued in the next post. My friend who bred spaniels- only an occasional litter, not regularly- wanted to ensure that her dogs went to good homes, and wondered if there was a way to write the contract so that ownership would revert to her if the dog was badly treated. I suppose the only way would be to lease the dog out rather than sell it. She groomed dogs as well. We played the piano together. I am not sure she did make a profit on it- merely because I found her a truthful person, and she made that claim. Interestingly Vicky mentioned to me about one animal charity writing a lease type of contract. Not in the interests of bad treatment (as I recall) but in case the original owner returned. Which seemed pretty stupid to me. You don’t home a rescue animal with the caveat that the original owner can suddenly turn up again. Who is to define bad treatment though? A dog locked in a crate all day? Confined to one room? Locked outside? Hit when it doesn’t behave? Has its nose rubbed in pee and poo? Like everything in life we all have different standards. I think the profit aspect depends how you cost it out. If you take time into consideration then no, of course not. Certainly with young Snowy I was getting up every two or three hours in the middle of the night to take him out. But food mimimal, vet’s fees – no more than the essential jabs, and that’s it. Nowhere near the four or five hundred quid min for a ped pup, let alone a thousand. Oh, I forgot the stud fee. I’ll be writing more about breeders in part 2. Oh, and I’m glad you commented because that has reminded me to link back to your blog, sorry I forget to do that originally. It depends what happens in law to abandoned property. In England, someone who takes an abandoned thing is entitled to keep it, but in Scotland men who took things from the rubbish tip were charged with theft. No idea in Spain, but it might be useful for the Home to spell out to the adopter that the dog did not belong to them. Interesting post. Did you know that Jen has never adopted an animal from a rescue group? Nope, we’ve all come to her needing home. That’s why the point you made about the nosiness of rescue groups needs to be heeded- I don’t HAVE to adopt from you. I can get a dog or cat most anywhere. Hiya Rumpy, thanks for the visit. In the Orwellian society that has become the UK, all loose dogs are rounded up by the dog warden and taken to wherever. Some even survive a few days. I exaggerate but you get the idea, so we never saw street dogs back then, hence using rescue shelters. But in Spain, people throw dogs out like yesterday’s rubbish, to me they need a home more than a dog who has a foster or a shelter home. I think the shelters are hit both ways. People like me don’t want the invasiveness and the checks – I’ve had dogs for 25+years with no problems – and yet, there was a case in the Uk recently where a rescue dog mauled a child. The woman lied about having a child and her rental agreement said no dogs! Whose fault is that? I would say the woman’s but it gives rescue dogs a bad name because the shelter didn’t follow up. If there were no unwanted dogs, I wouldn’t buy one, I would put my money into other animal welfare. But there always will be unwanted dogs, and so long as there are, I’ll try and provide a home. Interesting post. I don’t have a dog, but would tend to go for the rescue dogs if I was looking for one. I like the idea of giving it a new chance in life. Thanks Lance. A dog would have been great company for you in your caravan trip around the UK. The only issue is they really need permanent commitment so when you are itinerant/between homes it may not be right for them. Very true. That’s currently my main issue. I don’t feel settled enough to be able to offer a dog the kind of stability it needs/deserves. Perhaps one day! Stability and commitment are big issues for taking in any animal. We took our first animal when we had bought a house, I had a permanent good job and my partner was self-employed which gave him the flexibility to take the dog with him/check on him during the day. Having said that, I know plenty of street people who have dogs, but I guess their life is pretty permanent and the dog gives them a sense of security. From one extreme to the other. Perhaps the pot was the issue then? I’ve tried on numerous occasions, but have never managed to keep one alive more than a couple of weeks. Maybe I should try again and re-pot. Apart from my first dog, a mastiff ‘given’ me for my fourth birthday, all my dogs have been either given away, found wandering or just arrived on the doorstep. I always thought the pedigree breeders to be running a scam – and the breed clubs they set up to protect their scam can do positive harm to dogs by their ‘standards’ for the breed. Puppy mills..I’ve had two poor old ladies from there, dumped when no longer useful…. Rescue centres and vetting….fuel for the self important and no guide whatsoever as to future treatment. Pet shops still exist here but at least spay and neuter low cost clinics are spreading spreading the word and reducing the numbers of unwanted animals. Do you know Ayak’s Turkish Delight blog? She and her husband feed strays and take in what they can on very limited resources. They and people like them put some of the big animal charities to shame. My father told me, on ‘giving’ me my puppy, that I would only come to harm with a dog if I or someone before me had done harm to that dog and it was my responsibility to see that no harm came to the pup at anyone’s hands and to approach all dogs with respect for them. And I thought I was moderately controversial! I’ll write more about pedigree breeders in Part 2. But yeah, breed standards ….. and the Must Look Perfect dog. It’s why it always reminds me of sexism, judging women and dogs on appearances. We’ve not had anything from a puppy mill. We did get three chickens from a neighbour with a big granja for chickens/eggs. They didn’t last a year :( Puppy mill equivalent, past their usefulness and just costing money to feed. Two out of the three rescues we used were good. But this was 1980s. And we looked good on paper, right address, no kids, me with a ‘respectable’ job, so no real fuss. Excellent advice from your father. So true. I’m amazed how many Americans do take in stray dogs. When everything seems gloom and doom it is so refreshing to read that there are good people out there. Yes, thanks for commenting on Pippa’s, lazy Pippa hasn’t signed in today :D I wanted to get this posted. Hugs to Chancy and tell him to move into that sun puddle. Snowy looks like he’s growing by leaps and bounds. All of our dogs have been always been (and will always be) rescues and we actually only went looking (to a shelter) for the first. The rest have just come to us one way or another. Since Ralph died, neighbors and friends and friends of friends have come knocking on our door with dogs who need homes. We’ve told ourselves that we aren’t getting another right away, but I don’t know how long we’ll be able to hold out. Snowy is certainly bounding around. I’ve only ever read about gorgeous Ralph so didn’t realise you had others before. Although why would you not. We’ve not been dogless but the one-dog period was a bit tough for me. I like at least two in my home. I didn’t have dogs until I was an adult (I grew up with cats) but have generally had two at a time ever since. Ralph shared his life with a beagle mix named Mowgli for the first few years with us, until Mowgli crossed over and we decided that one large dog was more than enough. By the time we realized that we a second dog might be a good idea, Ralph was older and used to being an only child, so we let it go. I did have family dogs, and I’ll mention those in the next part. I think Partner suddenly woke up to the fact that Pippa was getting older and if we wanted a young one to learn from Pippa we needed to pull out our fingers. Although Pippa’s been an only child for six years or so, he’s remarkably placid with Snowy’s puppy antics. When we were in our last house in the UK, one of neighbours (spitefully) nicknamed us hillbillies, so I was most attracted to your name, even if we don’t see eye to eye on politics. I am so not conservative! But thank you for commenting, and so good to hear that you home abandoned dogs, like so many other Americans who have commented on this post. Hope you visit to read part 2. I wrote about my first Spanish street dog on his blog, he had a torn bleeding ear, a ring of pink fur around his neck and was so frightened. He’s the big furry one in the photo on the lead in Gib and on the sofa. As you say, clean them up, feed them, and look after them. I am a dog dude! I can get along with anyone if they love the pups. My dad always liked to say; “the more I see of my friends, the better I like my dogs” And my dad was even more conservative than me:) Every time I see my pups, there is no doubt that thiere is a God in Heaven! I will read part two also. Well, then, we are the same. Your dad def had it right. I like that dogs – and other animals – can transcend differences. Part 2 in a couple of days. Absolutely. Keep the politics light and the beer flowing. Don’t have a dog either, but if I were to have one, I would opt for a rescued dog any day! Cannot fathom how people can just dump puppies in dust bins!!! Why don’t they hand them over to shelters instead?? Shelters are often full Madhu :( to the extent that in Spain a lot of them are homed with people waiting for someone else to give them a permanent home. As Helen said above, what is really needed is spaying and neutering programmes – or a little responsibility from owners. Ms. Gib, as you probably know there is no argument from me here. The only thing that I have to say that might be different and I might have missed this in your post, is that there are rescue groups who do not specialize in breed specifics. “We” have two rescuce groups in my “town” in central Texas that come to mind and these are non-profit 501 C3 orgs. with members/fosters that take what they have room for and remove adoptable dogs from “our” city shelter that currently is putting down all animals after 3 days. At least that is the last that I’ve heard and/or read. Free puppies and kittens are a dime a dozen here. The shelter charges 50 bucks to drop off an animal so people have now begun dumping dogs and cats in certain parts of this county. It makes me ill. The city has plenty of money but places next to nothing priority on running the shelter in a compassionate manner. There are rich folks galore in this town but they choose to donate their money to the huge Baptist University so that a building or a wing or whatever will have their names as a prominent feature in the front of the building. Nothing wrong with donating to colleges but gee I would think that some folks could spread their money around to the creatures that can not defend or speak for themselves. As you know I have a passel of dogs and cats and all are saves from the street, feral, or showed up at my house. One dog came from the Ft Worth,Tx city pound (due for euthanasia next day before being saved by a “dog rescuer.”) My little dog Kippy, I obtained from the local pound when he was on display at Pets Mart and I knew that no one was likely going to adopt a mutt that was so ugly. “They” had done nothing to make him presentable and he was just really an ugly dog. My vet told me that Kippy was the ugliest dog that he had ever seen. (I no longer use that vet who I had used for about 30 years). Anyhoo, I do without many things in order to give my animals a good home, kindness, food, vet care and, love. They have returned the favors ten fold. I would not trade my animals for a new stone home or a new SUV. I did mention ordinary shelters in my ‘hierarchy’ of how to acquire a dog. They came after street dogs. I am so far down the road of rescue dogs that I am no longer interested in a breed. As I said, I have my favourites – if someone dropped a GSD on my doorstep I couldn’t say no. But if someone dropped any dog on my doorstep I couldn’t say no. I wouldn’t have gone looking for a Podenco but now I have one I adore Snowy. I spent ages tonight talking to someone who has a Podenco cross, (rescue), we discussed their traits and personalities and it was so much fun to chat. Breed specifics are interesting. I think they do a good job. They sort of cater for the middle ground, people who will rescue but want a certain dog. Better than buying from a breeder for shedloads of money. I don’t think Snowy is pretty – but others do. Who cares though? he has a wonderful personality and needed a home. That’s it to me. After posting this, I thought I wouldn’t get so many comments, dog rescue is such a sensitive issue, so it is so nice to see some decent comments on this topic. Cats here, no dogs. But all our cats have always been rescues and strays. No purebreds for us. I read this earlier today, before there were many comments and didn’t really have much to write except YES, YES YES, I totally agree. But what has really come across loud and clear from further comments (I’m guessing not UK inhabitants) is the amount of street dogs around. I can honestly say, I have never seen a street dog, they get rounded up by the local council dog warden, long before they get to live rough on the streets. Whether that is a good thing or not, I’m not sure, some are lucky and get transferred to no kill rescue centres, where they wait patiently for a new home. Others, sadly have seven days before their life is ended. 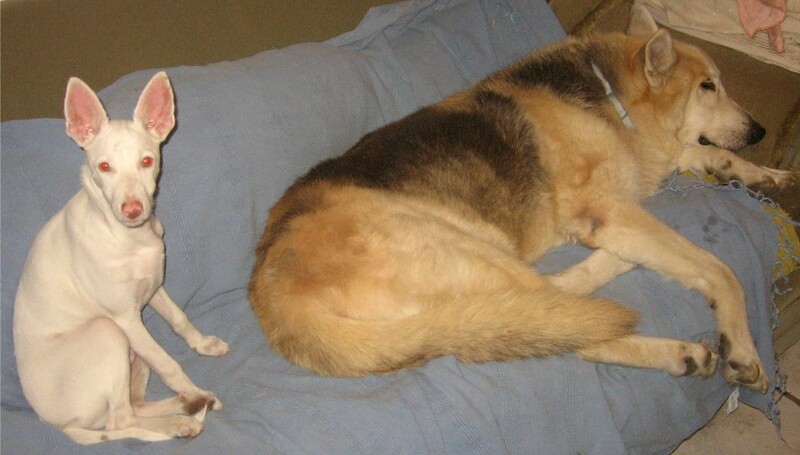 Two of my dogs were street to rescue dogs, One was on her sixth day when a kindly old lady took her from the pound and transferred her to a rescue centre. As for a home visits, two of mine came from a rescue that didn’t do home visits as it would not have been economically viable for them. A third from a rescue that did. I didn’t feel at all interrogated by the visit though but perhaps observations were made that I didn’t realise (like signs of young children), as the dog in question was recommended for children of teenage years or above. The death of the child you mentioned above, may have been prevented if the rescue in question had vetted the woman’s home, but that is something that no one will ever know. I think rescues are a controversial subject, moreso than pedigrees. They are all ‘bad’ or ‘dangerous’ or ‘second-hand’ or ‘flawed’ – then there is the checking issue, the cost to pay to the shelter etc etc, you know the issues as well as I do. I’ve been surprised by the comments too, and like you, think the UK situation is different with dogs being rounded up and pounded up. Maybe some of them would be better left on the streets given the seven day limit. That’s terrible. Poor Princey would have been a no-hoper had he not gone to a nice shelter. When I was a kid, I do remember seeing loose dogs on the council estate across the road, and again, many years later in Newcastle where we also lived near a small estate. I doubt they were strays, rather that people on the estates had the Spanish style of dog mismanagement and just let them out to go walkabout. Street to rescue dogs are wonderful though. They are so pleased to have a happy home and change totally as they gain confidence and accept whatever love and care you can give them. As for the death of the child, I don’t think anyone can blame the shelter for the apparent lies the mother told – no, she didn’t have children, and dogs weren’t allowed in her building. I ask you. What sort of responsible person is that – not – to home a rescue dog. My biggest surprise writing this post, which I’d flagged up a while ago, is just how many people do home street/stray dogs though. When we took in Pippa, some people looked at us as though they wanted to be wrapped in clingfilm because we might be harbouring dangerous lurgies. ‘How could you do that? He would be soooo dirty’ !! A street dog culture is bad in one sense, but good in another in that people are happy to rehome them (more than I would have expected) and as Helen said, it cuts out the bureaucracy. An odd result from this post!! I have often thought some would be better off left on the streets too, at least the ones not ‘lucky’ enough to be transferred to a no kill rescue would stand a better chance at living. There plenty of kill rescues too, two well known UK rescues Battersea Dogs home that you mentioned, and the RSPCA admit to putting animals to sleep. I too can remember from my childhood dogs that wandered the streets, but as you mentioned they were more likely the ones known as ‘latch key dogs’ left to take themselves for a walk. A stray dog these days is soon whisked away by the dog warden, and owners wanting their dogs back have to pay a fee. Our highly ‘policed’ society (ie in this case dog wardens but also the officials who visit shelters to order euthanasia of so-called dangerous dogs see link to article in main post) hasn’t done a lot for anyone, or any dogs. Virtually everyone says the Dangerous Dogs Act and the subsequent amendment is rubbish. I remember some stats from years ago where the dog most likely to bite you was a cocker spaniel. And is that on the list? No. It’s nothing but paranoia and knee-jerk reactions. A slight tangent but it’s all on the same theme. I am not a dog lover, as you know, but I certainly couldn’t dispose of them in a rubbish bin or throw them out of a car window! Well done on rescuing Snowy! Now you were the last one I expected to comment on this post! I know you said that I shouldn’t read the post but I did anyway. I have a genuine fear of dogs but that is my personal phobia – dog lovers might struggle to understand that but I wouldn’t ever condone cruelty. I like cats! It wasn’t directed at you personally! Just that if you (ie anyone) aren’t interested in dogs not much point reading a post totally about dogs, apart from the fact that the rescue principle applies to other animals too. For whatever reason I understand people have a fear of animals – whether dogs, horses (huge teeth and big hooves!) or any other animal. I obviously like most animals, but I think the important thing in dealing with them is 1) to respect them and 2) not to show fear – they are too cute and can sense it, so I’m guessing your dog phobia just gets reinforced every time you go near a dog. Pippa is normally pretty good with everyone, certainly never bitten or gone for anyone, and if they aren’t interested in him, he looks bored and stands aloof. Of course as he is big and looks like a wolf/GSD he would probably send your paranoia into overdrive!! Of course I realise that it was a general rather than a specific warning and I also acknowledge that my dog problem is mine and not the dogs! I think it may be the same with cats because they seem to sense fear and deliberately play up to it! But cats don’t frighten me – except lions and tigers – they frighten me! Interesting developmental thoughts. It worries me when my grandchildren are around dogs – perhaps I shouldn’t, I don’t want them to grow up with my phobias! Interesting how environment and family values have such a profound effect on later development don’t you think? I’m still getting over my horror at Snowy being dumped in a rubbish bin. I’m well aware that people do awful things to animals but I’ll never being able to come to grips with it. In a recent comment, I mentioned some pop-culture people we know who don’t get the G.O. & I, and vice versa but their life, their choice. However it irks me/us that they recently acquired, as ever via retail, in this case from breeders, 2 dogs, which they ordered. The first, a female cost $1300, the second – male cost $1500. Of course they have to breed them, just once, yeah right. We want the kids to see what it’s like to have puppies… yeah right. They’re out to recoup costs. My/our dogs and cats have found us, so I’m not up to speed with the rescue group house inspections, sounds tenuous. Anyone can pretend or get an animal from elsewhere, as you & Jen say. Even in the pet shops, some aren’t that exxy. Too cheap really. I know it’s only some (but still too many) humans who are missing the point but I wish all humans would get that animals, birds etc are not possessions. They come into our care, and care for us. They deserve so much better than to be lumped in with goods & chattels, or worse. Rubbish bin dogs are par for the course here. Plus, just to make matters worse, as far as I know, it wasn’t an open one, it would be one of the closed ones where you life the lid and chuck in your unwanted puppy rubbish. Something tells me I wouldn’t like your ‘friends’. I did look up prices before I wrote this post, average pedigrees are in the mid hundreds and edging upwards, but once you start getting puppies from show champion stock the prices are astronomical. I find it disgusting, I really do. I think the UK is slightly different to bigger countries like Spain, Aus, the USA. We are quite regimented :( and tbh, for city people, stray dogs just don’t wander up to you in the street to ask for a home. As Vicky said above, the dog warden goes around catching them all. Sounds a bit like 101 dalmations. But if you don’t want a pedigree, or at least you don’t want to buy from a breeder you can always get a pedigree/pure bred from a rescue), then shelters are the way to home an unwanted dog. You just have to pick the right one that isn’t too invasive and doesn’t have 50 million clauses where you sign your life away. Me, I’m happy with dumped street dogs. Much easier. Pippa and Snowy might have been treated as unwanted objects by at least two people, but they are both very much wanted now and part of our life. PS You are on a roll with comments today! Thank you. Working on Part 2 now. And then I can go back to Gib and Spain generalities. And books. And gardens. The header picture is adorable. Perfect Christmas “peace on earth” shot. Dogs needing homes just find me. Husband had purebred boxers and Shepherds as child. But the AKC and overbreeding/poor breed management has made it difficult to find healthy GS…my sister-in-law got a whimpy one – and she’s a vet that searched for one like her childhood. Complications of life made it easier to be dogless for years. But when the German needed a place to rest and recover, we couldn’t say no. So many dogs need homes. There are breed specific rescues that foster dogs out of city shelters until they can be adopted, so if you are determined to get a specific breed – check with the breed rescue groups first. They will help you find the dog that matches perfectly – most know the dog’s histories and how they fit with children, fence requirements, and if they will work with other animals. We’ve found half grown dogs are good as you can see what they are ( size/ temperament) – you just have to be patient and do some retraining. Some city shelters are pretty snooty about letting dogs go – which is odd as they are always complaining they have too many dogs. Some require references, and interviews, and home visits…they may mean well, but really? Here they do have to be careful because some want dogs to use as bait for (illegal) dog fight training, and some want to “adopt” dogs when actually they plan to sell them for medical research animals. This may be why rescues really scrutinize people wanting to adopt. We worked very hard to get roadside animal sales stopped in our last county. Here in a different county, we have to start that effort all over again. Mixed breed dogs offer better health and temperament – they get the best of both breeds some how. But if any dog needs a home, and you want it, that’s the dog for you. It is odd, but California shelters send toy dogs and chihuahua dogs to Texas where they are adopted very quickly. And Texas sends many large dogs/large mixed breeds to Denver and CO counties where they are rapidly adopted – CO says the TX dogs are the most even tempered and happiest dogs – there’s a big demand for them and there’s a van delivering already spoken for dogs up there once a month. Seems like everyone has big dogs hanging out the window in CO – all on the way to go hiking. What’s better than going down the road with a happy dog? I thought the German was calm and serene – or is it Molly that creates the havoc when the German arrives? Ah the breeding of GSDs and subsequent health problems is nothing short of criminal, as with many other dogs – check out the link from Maurice, think it is in the comments on the Part 2 post. Very nice photographic comparisons of pre and after breeding changes to meet ‘standards’. The more I have different dogs, it seems there isn’t so much difference between breeds. I can’t say I have ever had a stupid dog (they may have thought they had a stupid person), they all just do things their own way. They have all been good at housetraining – even little Snowy has started coming to sit in front of me when he wants to go out :) but again, they all do it differently, some lift a paw, some go to the door, some bark, Pippa dances around. Up to me to recognise what they are asking. I do love some breeds, you’ll know I’m a GSD fan. And I love Pippa’s GSD/husky cross temperament and appearance (well, we won’t mention cats here sssh RC). But I’d have any of the breeds/crosses I’ve had again, and I’d try something new too, as with Snowy not that we knew what he was when we agreed to take him. I guess that’s why I’m not so breed specifically bothered any more. Dog needs home – here is a home. I think the rescue thing through shelters is so difficult. The shelters can never get it right. Bad owner? Shelter’s fault for not checking out. Righteous person like me? Nosy intrusive shelter shouldn’t have to check me out. It was handy asking our vet for any dogs that needed a rescue, because that gave us an automatic recommend. OK so it wasn’t to a shelter but at least the woman who had found Snowy knew that we used Pedro and that Pippa was a buen perro. I didn’t know people sold dogs on the side of the road! Opportunistic. Like selling oranges, potatoes, olives eh? And no taxes. Cash sale. Chihuahuas and small short haired dogs should be happy in TX, nice and warm. Snowy might come to visit Molly and bound off that furniture together. He’s also taken to biting my wooden chair – so they could discuss wood-biting strategies too. oops – that is care. not car, LOL. for the record, some animals don’t like to be in a car. but they certainly appreciate good care! Hey they are just my views. Other people may have different ones. In fact others do, but they don’t read/comment on my blogs. Pedigree animals are nice, and we have had some but they came from rescues/the street – Snowy is pure Podenco Andaluz. I don’t like the obsession with breeding every supposed visual flaw out of an animal especially to the detriment of their health for the purposes of showing them in a ring. If there were no animals to rescue, I would have a different view – but there will always be animals to rescue.